Renewable energy (RE) is the biggest mitigation tool to combat climate change and limit average global temperature rise to below 2°C, as targeted in the Paris Agreement. Countries have also included RE development in their Intended Nationally Determined Contributions (INDCs). But the three countries appear to be adopting three very different policy approaches to renewable energy. In India and China, policies are favourable for renewables, driven not only by climate action, but other reasons as well. The new administration in USA, on the other hand, is focused on keeping coal jobs and supporting shale and natural gas. With USA backtracking on climate action, it is likely that India and China will outperform it. In 2016, combined investments in renewable electricity from China, India and USA were US $134 billion—almost 55 per cent of the global investments in the sector. Solar energy was the most popular within these countries, accounting for 56 per cent investment, and wind followed with 40 per cent of the funds. First, the good news: additions to installed capacity of RE have been steady in all three countries and have overtaken investments in fossil-fuel based capacity (See Figure 2). However, RE investments in China has declined by 32 per cent and in USA by 10 per cent in 2016 compared to 2015. India’s investments in RE has remained unchanged in 2016 as compared to 2015. Newly installed capacity increased globally from 2015 to 2016, since the capital costs decreased considerably. What China and India are doing? China is well on track in achieving the targets set in Paris Agreement. China’s pro-renewable policies include tax reliefs, net metering and feed-in-tariffs (FiT). In 2017, it plans to launch a national emission trading scheme (ETS) and renewable energy certifications, to add to the sector’s development. The slowdown in investment in China is because of the need for regulation to integrate increasing shares of intermittent RE power in the grid. 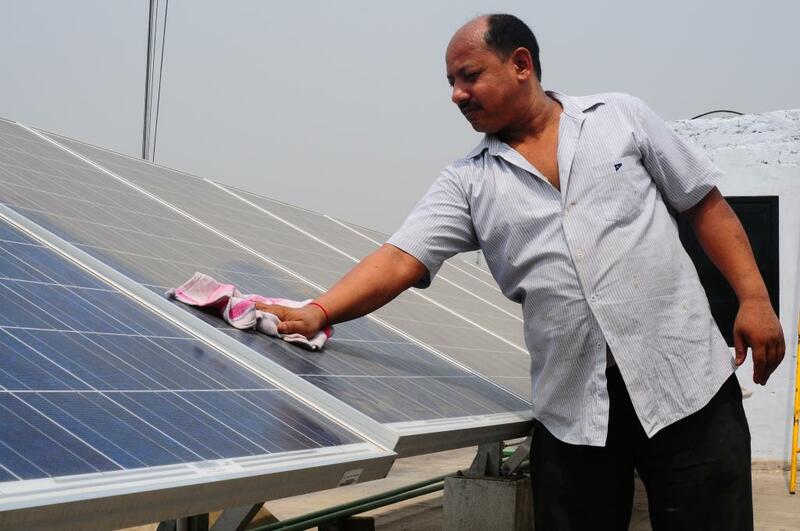 India has set ambitious renewable targets, pushing aggressively for the sector’s development. The growth of coal use is slowing down. Solar and wind installations in 2016 exceeded the yearly goal by 116 per cent and its 2022 renewable energy targets by 43 per cent, with direct efforts to promote RE on the basis of cost-competiveness. Some 60 per cent of all the newly added energy capacity in USA was in renewable form, but investments are limited to a few states that have favourable policies. Development of renewables has been driven by the Renewable Portfolio Standards (RPS) set by various states, and reduced capital costs which increases cost-competitiveness of RE. RPS is a regulatory mandate to increase share of RE in energy mix, and are implemented in 29 states in the US. Coal power plants are at the end of their operational life and face competition from shale gas and RE. But the positive trend may now be threatened as the new administration plans to revive domestic coal power sector and scrapping existing low-carbon policies. President Trump signed an order last month to review Clean Power Plan (that commits federal agencies to several actions) and any other regulations that “burden the development or use of domestically produced energy resources”. The government also plans to give unobstructed support to fracking and natural gas. “With policy retrenchment beginning to take shape under an ‘America first’ energy blueprint, we expect China and India to outcompete the US, for the second-consecutive year, in providing an effective and reliable green policy environment”, says Ritika Tewari, climate policy analyst at NewClimate Institute. Deep dive: what do current policy developments in China, India and the US mean for investing in renewables?